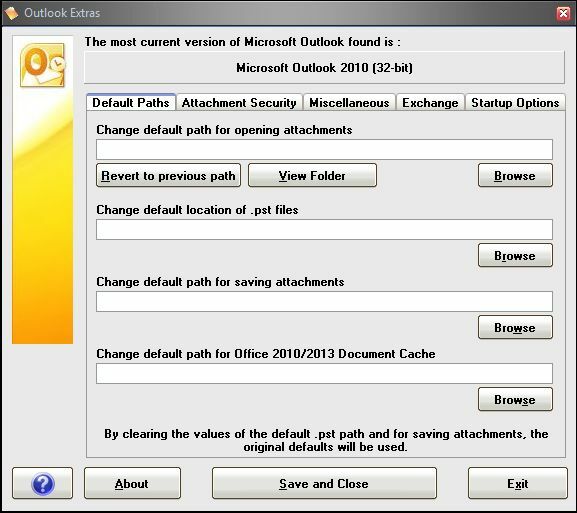 This utility will allow you view and change some of the default actions of Microsoft Outlook to allow you to change file locations of .pst/.ost and attachment files, allow blocked attachment extensions, change Exchange settings, etc. 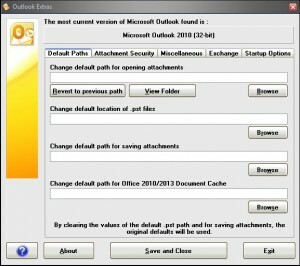 This program is designed to work with Outlook 2000, 2002 (XP), 2003, 2007, 2010, and 2013. Simply unzip the file and run the executable. You can download version 2.5 here. Changes/fixes in version 2.5 : Added Office 2013 (32/64-bit) compatibility, fixed overall compatibility with 64-bit Windows versions, added ability to view Outlook Add-In status, other minor bug fixes.